We’re fascinated by the potential of LightUp, a system for teaching electronics based on a combination of real, physical electronic components, paired with an augmented reality app to help guide the way. 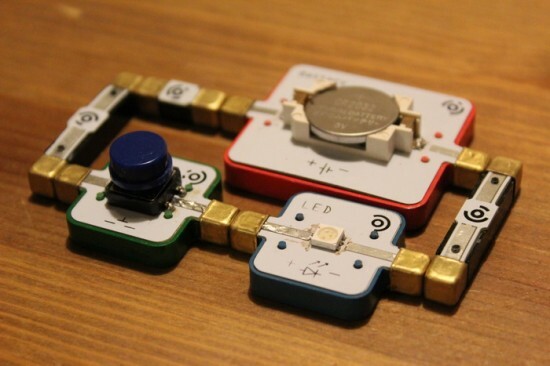 Based on a series of blocks that snap together magnetically (much like LittleBits), kids (or anyone, really) can experiment with common electronics in a fun and intuitive way by moving pieces around. The blocks are marked so that the app can read exactly what’s going on, and then offer a kind of engineering X-Ray vision of what the outcome of the circuit will be. Animations indicate where LEDs will light up, and what direction the current is flowing. The pieces also have common electronics schematics so kids are exposed to the symbols throughout the process. We’re excited not only about the potential for this project, but how other augmented reality systems such as these can serve as rich tutoring systems for all kinds of abstract topics.